As always, let's take a look at the final result before examining some of the underlying details and limitations of the shortcut. 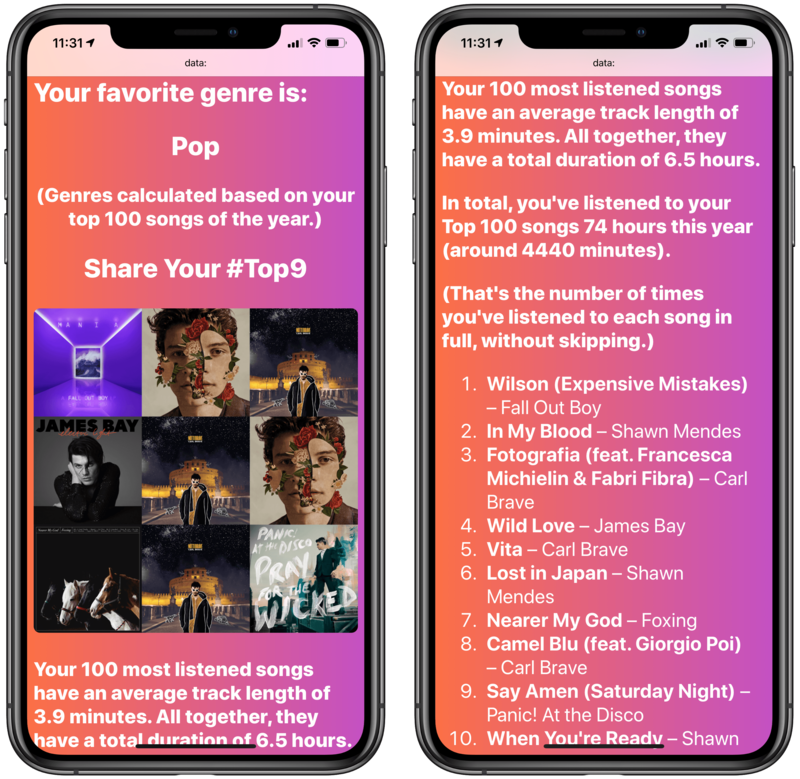 Apple Music Wrapped generates a personalized music report that, by default, collects your 100 most-played songs added to your library in any given year since Apple Music was launched in 2015, sorting them from largest to smallest play count. The shortcut takes less than 30 seconds1 to run and the final report is opened in Safari as a custom webpage. There is essentially no configuration needed to run Apple Music Wrapped on an iPhone or iPad. 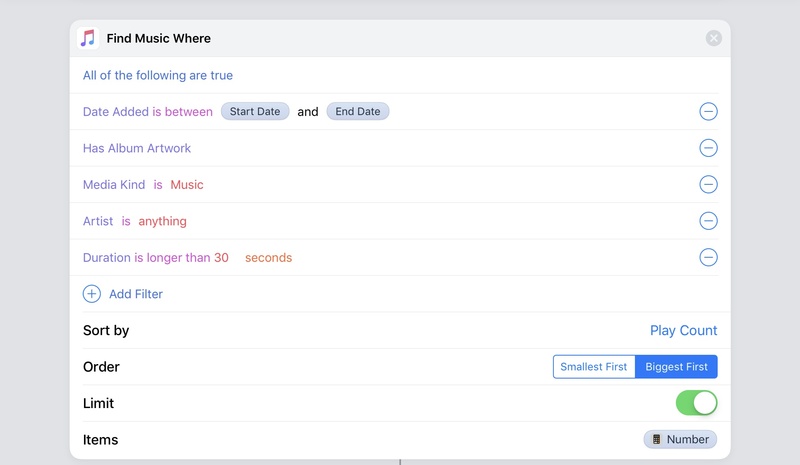 Upon installing the shortcut, you'll be presented with two Import Questions to change the number of songs to analyze and the year for which you want to generate a report. 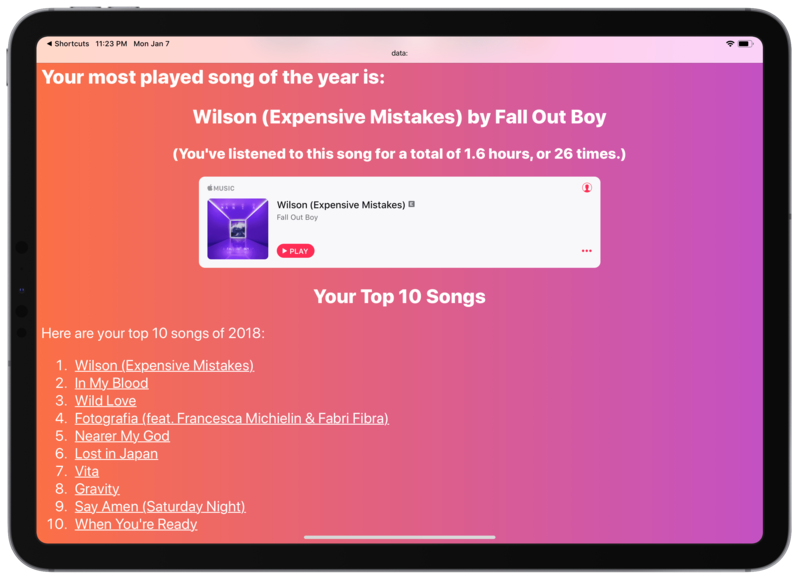 By default, the shortcut evaluates your 100 most-played songs added to your library in 2018. If you use Apple Music but never add songs to your library, this shortcut won't generate a report. Also, for the best experience, I recommend running this shortcut toward the end of the year (for reasons I'll detail later). If you want to change the song and year values, you'll find two variables near the top of the shortcut that you can modify. ...or later inside the shortcut itself. You don't need to change anything else. 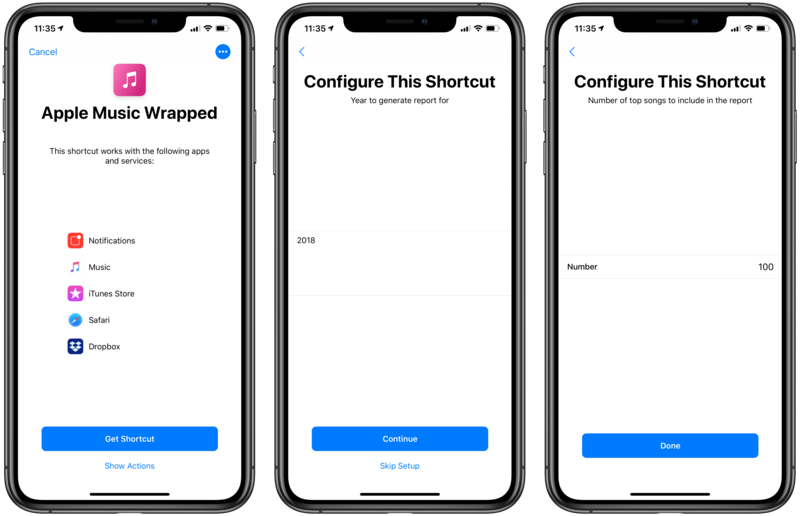 For the shortcut to work, however, you'll have to grant Shortcuts access to your Apple Music library and notifications, which will be used to communicate progress while the shortcut is running. Local notifications are used to display progress while the shortcut is running. You'll be asked two questions while your Apple Music Wrapped report is being built. 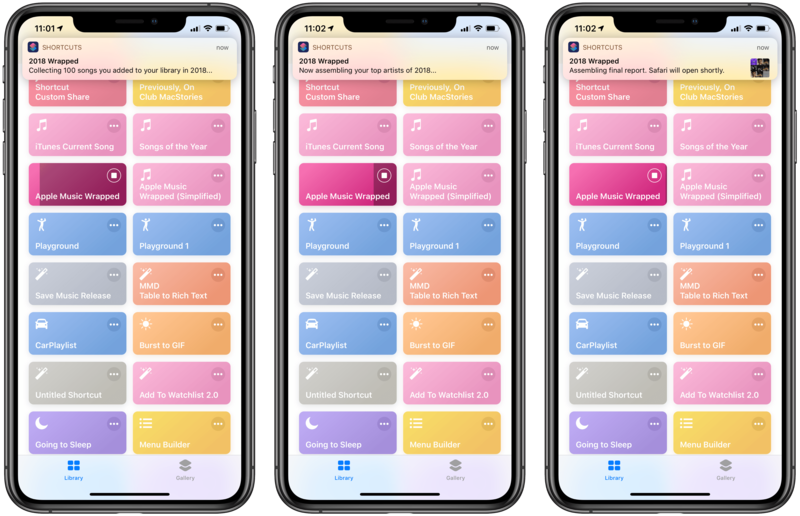 First, you'll be able to choose whether or not you want to create a playlist containing your Top 25 songs of the year; if you accept, the shortcut will create a new playlist in the Music app. To skip the playlist, tap 'Nope' and continue. The Top 25 playlist created by Apple Music Wrapped. Second, toward the end of the shortcut you'll be given the option to save a PDF version of the report either in the Files app or Dropbox. Again, tapping 'Nope' will continue the shortcut without consequences. Because Shortcuts is creating a webpage and sending it to Safari with an extremely long URL scheme (more on this below), you're going to have to wait a few seconds after Shortcuts launches Safari for the full report to be displayed. I've been working on this shortcut every day for the past couple of months, and I tried to comment every sequence of actions for clarity and future-proofing. While I'm sure I forgot about some weird edge cases (and if you run into issues, please let me know), I'm happy about the fact that this shortcut runs fast, has no external dependencies, and doesn't save any additional configuration/cache files in the user's iCloud Drive account. With this in mind, allow me to clarify a few important points about issues and limitations that are unfortunately outside of my control. Apple Music Wrapped pushes the limits of what is possible to achieve with the 'Find Music Where...' and 'Open URLs' actions of the Shortcuts app. 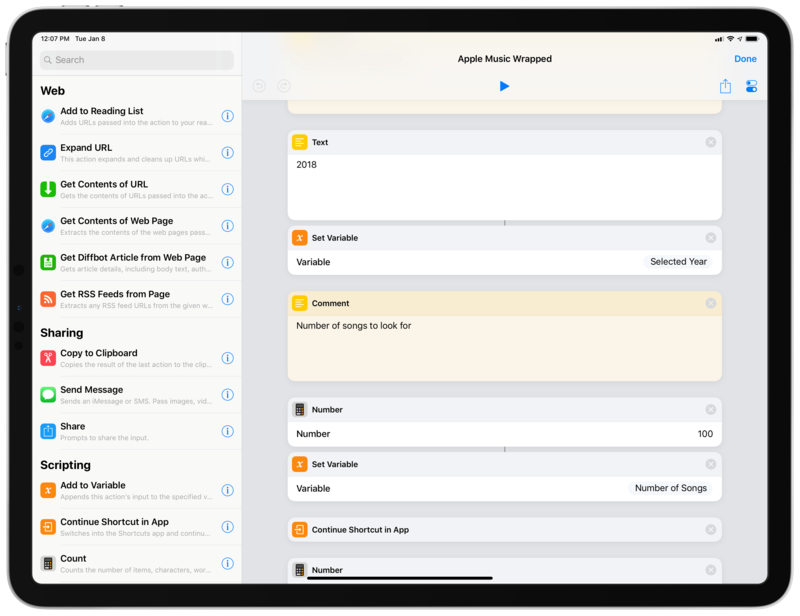 In the past few weeks, I (and other testers) have run into limitations and inconsistencies worth pointing out both for MacStories readers and Shortcuts engineers at Apple. First and foremost, you'll find that running the shortcut for the same number of songs and the same year multiple times may result in slightly different counts for top artists and songs. This is due to the fact that the 'Find Music Where' action doesn't always return the same set of items when filtering your music library. This problem also applies to play counts: it appears that Shortcuts' Music actions only count a song as played if it's been played in full without skipping, but in my experience, these counts may also be different across devices or inconsistent across different runs of the shortcut. 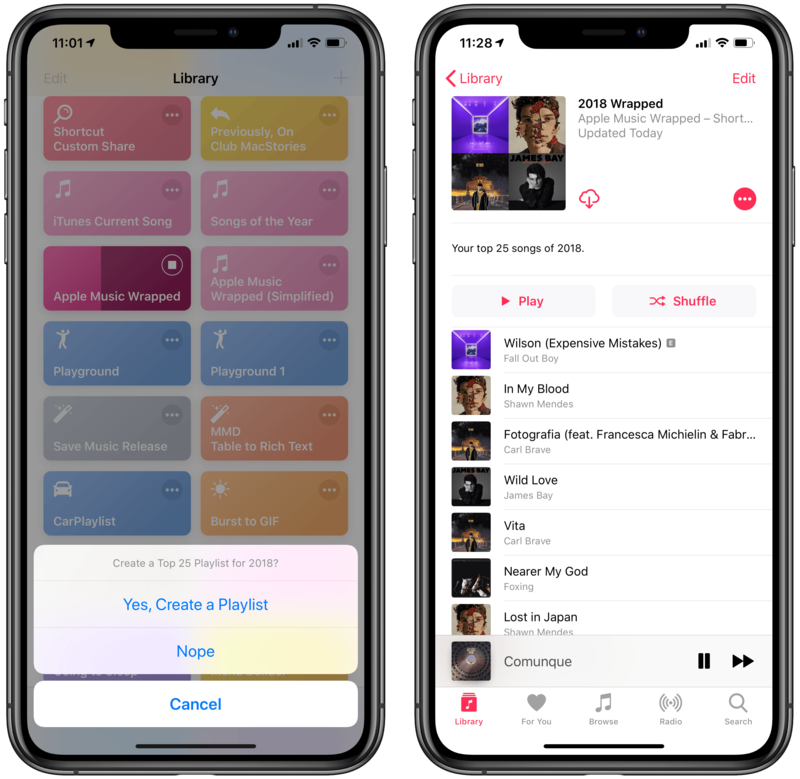 I brought all of these issues to the attention of the Shortcuts team at Apple, and I hope they'll be able to ship more flexible and reliable Apple Music filtering actions in the future. Everything revolves around this initial filtering action. You may receive a "Couldn't communicate with a helper application" error message at the end of the shortcut. My understanding is that this is a memory-related issue. Usually, you can "fix" it by force-quitting Safari, the Shortcuts app, or both, and trying to run the shortcut again. After running the shortcut a few times and generating multiple reports, you may notice slowdowns when typing search queries in the Safari address bar. My guess is that this is happening because Safari keeps the long URLs used to assemble custom webpages in its history. Once you're done with the Apple Music Wrapped reports you want to see, I highly recommend clearing your Safari history and website data on all your devices. Everything would be so much easier if only Safari for iOS could open plain .html files like it can on macOS. 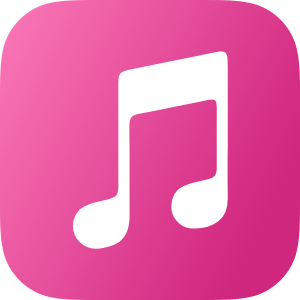 Apple Music Wrapped filters songs based on the year they were added to your music library. If you just search and stream songs without saving them to your library, the shortcut won't find them. Because the shortcut looks for songs that were added between January 1 and December 31 of a specific year, it's primarily designed to give you an overview of new songs that you listened to in the past 12 months. Play counts are not specific by year. To my knowledge, there is no way in Shortcuts to say "give me the number of times this song was played in this time period" (if I missed this, please let me know). This shouldn't be a problem for the 2018 report and future reports if you run them toward the end of each year, but may result in inflated play counts for songs in older reports (2015-2017). If the shortcut finds a song in your library that isn't available on the iTunes Store because you uploaded it from your computer, it will not be linked in the Top 10 Songs list (as there's no iTunes link for it to begin with). In theory, this shortcut should work for locally-uploaded tracks if you never add anything from the Apple Music service, but I haven't been able to test it under such conditions. The "duration is longer than 30 seconds" song filter just doesn't work. I wanted to exclude interludes and other short non-song tracks that are often present in albums, but the 'Find Music Where' action returns them anyway. Oh well. The Top 25 playlist can't be automatically shared by Shortcuts with a link. If you want to share it with others, you'll have to do so manually. Apple Music Wrapped is the shortcut I'm most proud of, but it's also one I hope Apple sherlocks as soon as possible. There's only so much data I can parse with Shortcuts' (buggy) Apple Music actions; ideally, Apple should copy Spotify's approach and build their own report with more precise stats for songs and genres, details about devices you listened on, days of the week when you're the most active, and so forth. I look forward to the day when, at the end of the year, Apple Music will send me a personalized report with a detailed, in-depth look at my listening habits for the past year. 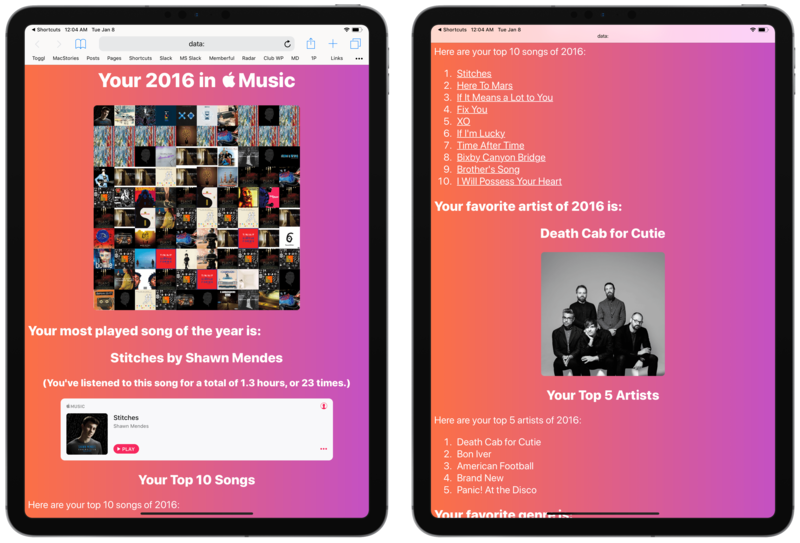 Until that happens, Apple Music Wrapped should be a pretty good workaround to quickly visualize songs, artists, and genres that defined your past 12 months in Apple Music. I had fun analyzing my music habits with this shortcut, and I hope MacStories readers can find it useful too. You can download it below.